Objective: Academic libraries are creating and experimenting with developing more diverse learning spaces for students. Measuring how students use these new spaces can be a challenge.This paper will report on a pilot project that uses web GIS to gather evidence of library space usage. The pilot project seeks to answer these questions: What evidence can GIS provide about library space usage? What challenges and opportunities does GIS provide for library space assessment? Methods: The pilot project uses a mobile tablet and a program called ArcGIS Collector to gather information on how students are using library spaces. Data was gathered during the Fall 2016 and Spring 2017 terms. Library space usage was mapped to different learning space types and supplemented with additional quantitative and qualitative data. 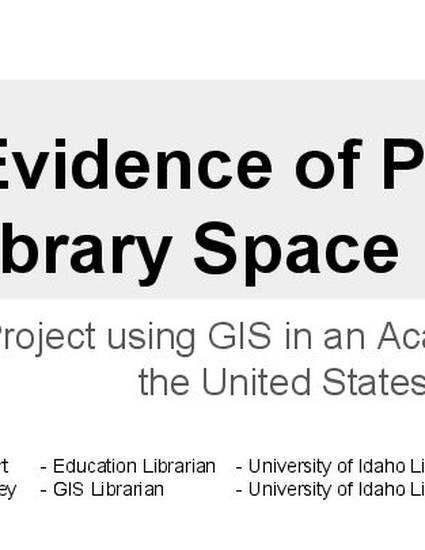 Results: Initial data and participant feedback indicates that this GIS pilot project gathers meaningful evidence to begin talking about how students use library spaces. Conclusion: Tablet and desktop based GIS programs such as ArcGIS Collector are an innovative way to gather and display evidence of library space usage.